Last weekend, I decided to head south the Okinawa Prefectural Peace Memorial Museum to hear once more about the devastation that took place during some of World War II's fiercest fighting during the Battle of Okinawa, otherwise known as the Typhoon of Steel. The Battle of Okinawa claimed the lives of over 200,000 people of all nationalities, of which more than 100,000 Okinawan civilians died, far outnumbering the overall military death toll. Okinawa was the only ground fought on Japanese soil and was the largest-scale military campaign of the Asia-Pacific war. This battle lasted for three months and destroyed most of the Okinawan landscape as well as much of the island's cultural legacy. 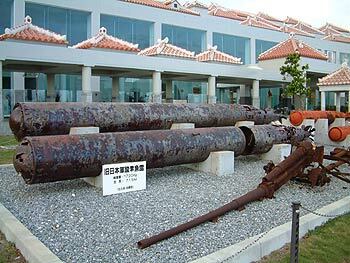 The Okinawa Prefectural Peace Memorial Museum is a testimony from the Okinawans as a prayer for peace that upcoming generations will never see the type of horror that was dealt to the Okinawans during the Battle of Okinawa. 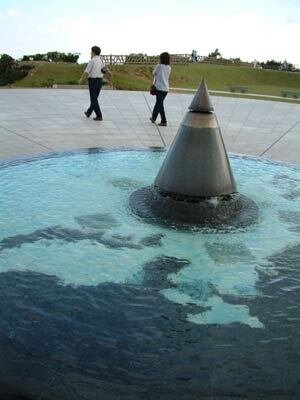 According to the informative pamphlet given out at the museum's entrance, the Okinawa Prefectural Peace Memorial Museum is a reflection of the Okinawan heart. "The Okinawan Heart is a human response that respects personal dignity above all else, rejects any acts related to war, and truly cherishes culture, which is a supreme expression of humanity." The message continues," "In order that we may mourn for those who perished during the war, pass on to future generations the historic lessons of the Battle of Okinawa, convey our message to the peoples of the world and thereby contribute to establishing permanent peace, we have established, displaying the whole range of the individual war experiences of the people in this prefecture, the Okinawa Prefectural Peace Memorial Museum." Though the park itself is very scenic and beautiful, it carries with it a somber, heavy intonation left behind by the survivors of this horrible battle. Though the sun may be shining, locals and foreigners alike quietly wander the memorial reflecting on the devastation that took place during one of the fiercest battles of World War II. As a whole, the park is huge. One could spend a whole day or two wandering each attraction and memorial of the park. 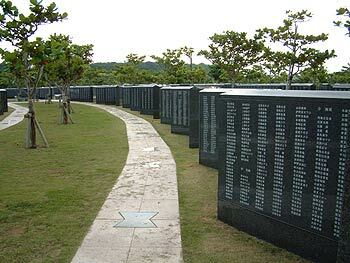 The park also has a National War Dead Peace Mausoleum with many monuments to those of all nationalities who died during the Battle of Okinawa. Each person from every nation who fought and died is named on various stone walls. The main attraction and most informative segment of the park is the actual museum. The Peace Memorial Museum is a two story building with many rooms and exhibits including a children's exhibition on the first floor called "Outlook for the Future." The second floor of the museum is all about the Battle of Okinawa, the events preceding it, and the repercussions that followed. Outlook for the Future (Children's Exhibition Room) is divided into three sections offering exhibitions and instructional aids to give children a chance to think about peace. Nuchida Takara, the first section, shows the diversity of the world by introducing 18 children from different countries who speak about their own schools, friends, and games they enjoy. This area focuses on global issues as well as daily concerns such as wars, regional conflicts, human rights issues, environmental problems, and problems with bullies, showing why these things occur and how they can be addressed and prevented. Warabina - Children's Playground gives children a chance to discover common ground through games played in different cultures and also understand their cultural differences. The second floor has five exhibits about the battle of Okinawa as well as information on post-war Okinawa. These areas are The Road to the Battle of Okinawa, The Typhoon of Steel, A Hell on Earth, Testimony, and Keystone of the Pacific. The Road to the Battle of Okinawa shows how Okinawa became a prefecture of Japan as well as Japan's invading of neighbor countries. The Typhoon of Steel, A Hell on Earth, and Testimony exhibits show the true horror that was The Battle of Okinawa. Especially important is the testimony section. "In the wake of its catastrophic devastation, very little physical evidence remained to convey the true nature of the Battle of Okinawa," says an informative pamphlet. "The only way those who died so dreadfully can speak to us today is through the testimony of Okinawans who experienced it." However, only a few of the testimonies are written in English, so it's best if you bring a local friend to help you unless you can read Japanese. The final exhibition Keystone of the Pacific shows how Okinawa's postwar began in refugee camps along with the United States engaging in vastly expanding their military bases. It shows the growing anger in Okinawa over land struggles and the military reversion movement. The Peace Memorial Museum shows the total devastation that accompanied the Battle of Okinawa in hopes that we will give peace a chance and learn from history that there are no winners or losers in war. "Whenever we look at the truth of the Battle of Okinawa we think there is nothing as brutal, nothing as dishonorable as war," says the park management committee. "In the face of this traumatic experience, no one will be able to speak out for or idealize war. To be sure, it is human beings who start wars. But, more importantly, isn't it we human beings who must also prevent wars?" Hopefully, future generations of locals and foreigners living on Okinawa will learn the lessons that were brought about by the sufferings of all nationalities who fought and died during the Battle of Okinawa. The Prefectural Peace Memorial Park is open from 9 a.m. to 5 p.m. everyday except for Mondays and it is closed from December 29 to January 3. Admission to the museum is ¥300 for adults and ¥150 for children. To get to Peace Memorial Park, take highway 58 south until it becomes route 331. Continue south to the bottom of Okinawa and you will see road signs in English and Japanese leading you all the way to the park. Free parking is available. For more information, call 098-997-3844.